Wild Times Guide Service holds two of the 4 available refuge guide permits issued by the U.S. Fish and Wildlife Service, providing access to over 80,000 acres on Lower Klamath and Tule Lake refuges. 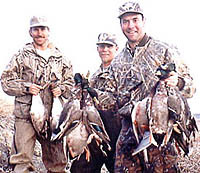 We also hunt Klamath and Agency Lakes, and the Straits unit in Oregon. We work hard to provide the best hunt possible, spending countless hours scouting and watching bird movements prior to each hunt.